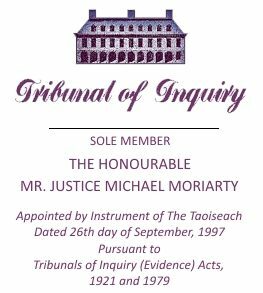 MR. HEALY: You recall, Sir, that in the course of the Tribunal’s opening statement made on the 22nd June 1999, reference was made in a general way, but only in a general way, to some of the matters with which the Tribunal would be dealing at this stage of these sittings. It was also indicated that, at intervals, more definitive opening statements would be made in relation to specific matters as they came to be dealt with in the course of the evidence being given at the Tribunal’s public sittings. Firstly, the accounts kept by Mr. Haughey in his own name in Guinness & Mahon between 1979 and 1987 and the lodgments or credits made to those accounts during that period. Secondly, other accounts kept by Mr. Haughey in other banks, including Merchant Banking, which is now dissolved and National Irish Investment Bank, then known as Northern Bank Finance Corporation. Thirdly, the Tribunal will examine a loan account Mr. Haughey had with Ansbacher Cayman, taken out in 1983. At that time, Ansbacher Cayman was known as Guinness Mahon Cayman Trust. In the course of the evidence, reference will be made to the Amiens Accounts. Now these accounts have already been mentioned in earlier Tribunal sittings and in due course, they will be referred to in other sittings in some detail but, as in the case of previous sittings, it will be necessary to deal with aspects of those accounts and in these sittings, they will be referred to in a number of different contexts which I will now mention. In the course of the 1980s, it would appear that certain credits were made to Mr. Haughey’s account or accounts in his name from accounts in the name of Mr. P.V. Doyle and it would appear that these payments were routed through or managed by way of the Amiens Accounts. Reference will also be made to a number of specific payments to Mr. Haughey or to Mr. Haughey’s accounts in respect of which the Tribunal has been unable to obtain any information except the most limited kind, but where the circumstances of the payments suggest that they require further examination. Now dealing firstly with the Merchant Banking loan, it appears from documents made available to the Tribunal that Mr. Haughey and a company with which he was associated, Larchfield Securities Limited, which has already been mentioned in evidence, were the recipients of two loans from Merchant Banking made respectively in June and July of 1976. The June, 1976 loan was for the sum of £6,000 and the July, 1976 loan was for the sum of £2,500. The Tribunal has obtained statements concerning these loans from Mr. Patrick Shortall who was appointed Provisional Liquidator of Merchant Banking Limited on the 4th May 1992 and also from Mr. Peter Fitzpatrick who was appointed Official Liquidator jointly with Mr. Fitzpatrick following a making of the Order by the High Court that the bank be wound up. Merchant Banking Limited was associated with the Gallagher Group and a number of members of the Gallagher family, together with persons associated with other companies in the Gallagher Group, were directors of the bank. The Tribunal has obtained an affidavit from Mr. Patrick Gallagher in which he refers to his knowledge of Mr. Haughey’s loans from the Bank. Now, initially Mr. Gallagher provided the Tribunal with a statement and it was envisaged that evidence would be given in accordance with that statement at these sittings. However Mr. Gallagher was obliged to return to South Africa, where he now resides, for urgent medical attention and he has, in the interim, provided the Tribunal with an affidavit which corresponds with the Statement of Evidence he had intended to give. In due course, the Tribunal hopes to be able to adduce the evidence of Mr. Gallagher, but in the meantime, his affidavit will be submitted and, if necessary, it may have to be relied on and it is hoped that in due course, there will be no objection from any person affected by the contents of it. As things stand, Mr. Haughey has agreed to the use of Mr. Gallagher’s affidavit in the Tribunal’s proceedings. Mr. Gallagher, in his Affidavit, has stated that his recollection of the loans is somewhat vague but that, from what he remembers, Mr. Haughey came into his office in or about the month of May of 1976 and informed him that he required a loan to build a house for his daughter Eimear at Kilmuckeridge in County Wexford. Mr. Gallagher agreed that Merchant Banking would lend the money to Larchfield Securities Limited, which he describes as Mr. Haughey’s company. In his Affidavit, he says that he cannot now recall the details of the loan and that he is uncertain as to why it was for two separate amounts, £2,500 and £6,000. Firstly, the fact that they were repaid only on the liquidation of the bank. Secondly, the fact that between 1976 and 1982, no demands were made for repayment and at no time was any repayment schedule agreed with the Bank in respect of either principal or interest. Thirdly, the fact that no security, except a Promissory Note, was sought by the Bank in relation to these loans, which at the time would have been quite significant in terms of then money values and particularly, in terms of the stated purpose of the transaction, namely the construction of a house for the sum borrowed, in or about £8,500 in 1976. Fourthly, the fact that the loans were ultimately repaid by sums debited from one of Mr. Haughey’s overdrawn current accounts in Guinness & Mahon. Mr. Gallagher has stated in his Affidavit that he now accepts that the loan contained unusual features, specifically the features mentioned above, and he acknowledges that he is aware that no demand was ever made by Merchant Banking for the repayment of the loan. He now acknowledges that this was also unusual. His comment in relation to these features of the loan is that he trusted Mr. Haughey implicitly and that he never considered that the monies would not be repaid when Mr. Haughey was requested to do so and that this turned out to be correct as the loans were repaid in June of 1982. It should be borne in mind however that the demand for repayment was made by the Liquidators. Mr. Haughey has been asked to comment on these loans and on the unusual features of the loans but has not to date provided the Tribunal with any information in relation to them. From the Tribunal’s point of view, what requires to be investigated is whether there was any commercial reality in the appearance of these two advances, bearing in mind the circumstances in which they were made, there being no security sought or given and the fact that no repayment was made nor any demand for repayment made by the Bank until it went into liquidation, by which time of course it had come under the control of the Court and not its original shareholders. I now want to pass on to Mr. Haughey’s dealings with Northern Bank Finance Corporation, as National Irish Investment Bank was then known. On the 17th December of 1980, Mr. Haughey obtained a loan from Northern Bank Finance Corporation for £150,000. This loan was eventually repaid on the 5th January of 1983. In the interval, between December of 1980 and January of 1983, some £52,000 approximately by way of interest had been paid in respect of interest due on this loan and ultimately, the loan was cleared by a payment of £149,981.41. The amount of the loan was credited to a Guinness & Mahon account number 28500/01/50. This was an account in Mr. Haughey’s name. The interest on the loan was paid by debits from this account. This loan has been mentioned so that it will be understood that it was the source of a substantial lodgement to Mr. Haughey’s account and that this lodgement should not be taken into account in calculating the total of the credits to Mr. Haughey’s accounts, the sources of which cannot be identified. It remains, of course, to identify the source of the funds used to pay the interest due on the account. To date, Mr. Haughey has not provided the Tribunal with any information in response to its request for assistance concerning the purposes for which this loan was made and the sources of the funds used to repay the interest due. this is the loan Mr. Haughey had from Ansbacher Cayman, which was then known as Guinness Mahon Cayman Trust. The Tribunal has obtained documents from the Central Bank concerning exchange control applications in the 1980s and from documents retained by the Bank which have been examined by the Tribunal, it would appear that on the 8th December, 1982 Mr. Haughey made an application to the Central Bank for exchange control permission to borrow the sterling equivalent of 400,000 Irish pounds from Guinness Mahon Cayman Trust of Grand Cayman in the British West Indies. The purpose of the loan was stated as being primarily the conversion, development and extension of Abbeville Stud. The application envisaged that the loan would be repaid in full by the 31st January 1985 and that interest would be payable half yearly at the rate of 1 percent over the cost of three months funds. The security for the loan was described as the joint and several guarantees of C.J. Haughey and Maureen Haughey and in addition, it was confirmed that the title deeds of the stud would be deposited with Mars Nominees Limited of 17 College Green, on behalf of Guinness Mahon Cayman Trust Limited and that an undertaking be given to formalise security the should that be required. The application for exchange control in these terms was not an unusual one in that there was nothing to prohibit any Irish resident from borrowing funds abroad in a foreign currency so long as it was clear that the purpose of the borrowing was not to speculate against the Irish currency and as long as the repayment schedule enabled the bank to monitor any opportunities there might be for speculation in the Irish currency. From documents made available by the Central Bank, it appears that on the 9th December, the application was approved by a letter from an Official of the Bank. This letter was addressed to the late Mr. Des Traynor and this suggests that Mr. Haughey’s application must have been processed by Mr. Traynor. Mr. Haughey’s file in the bank appears to have been retained separately from other files and was not part of the ordinary file storage or retrieval system. The letter containing the approval which was addressed to Mr. Traynor indicated that should any problems arise, then direct contact should be made with certain named officials of the Bank. It appears that the loan was not repaid within the time scale originally envisaged. As a result, and this was again not unusual, it became necessary to make another application to the Central Bank and this was done, as had been suggested by the original Central Bank official, directly to Mr. Michael O’Donovan. The application was made on the 22nd January of 1985. It attached a copy of the original letter of application, together with the original grant of approval and a copy of a letter from Mr. John Furze of Guinness Mahon Cayman Trust Limited outlining the new terms under which Guinness Mahon Cayman Trust were prepared to extend the loan facility. Effectively what was required was approval for the extension of the loan in the same sum, sterling £350,000, (the approximate equivalent of £400,000 Irish money), and the incorporation of a new payment schedule up to the 31st January of 1986 at the same interest rate as before. This application was approved by the Central Bank on the 5th February of 1987. Again, it seems that the loan was not repaid within the revised payment period and it therefore became necessary to apply for a further permission to extend the repayment schedule. This was done by letter from Mr. Des Traynor of the 21st January, 1987 to Mr. O’ Grady Walshe, General Manager of the Central Bank. From a handwritten note endorsed on Mr. Traynor’s letter after it was received at the Central Bank, the application appears to have been approved on the 21st January, 1987 or perhaps on the day after that. By letter of the 23rd January of 1987, this approval was formally notified to Mr. Traynor by Mr. O’Grady Walshe. As there were no further applications for extensions in respect of this borrowing, the Tribunal thinks it reasonable to assume that the loan was paid off. It has sought the assistance of Mr. Haughey in order to identify the accounts into which the loan was paid and also the sources from which the interest and ultimately the principal was repaid. No other documentation is available to the Tribunal at this point, apart from that obtained from the Central Bank. The Tribunal has sought to obtain information from Ansbacher Cayman. As usual, in the case of any requests by the Tribunal to a bank for information concerning its customer, the Tribunal sought a waiver from Mr. Haughey to enable the Bank to disclose the information being requested, notwithstanding the Bank’s duty of confidentiality to their client. Although Mr. Haughey has furnished waivers in relation to other banks, no waiver was provided by him in relation to this Bank and this particular loan. I now want to pass on to Mr. Haughey’s accounts in Guinness & Mahon in his own name and in one case in his own name jointly with that of another person. Firstly, to ascertain the total sums lodged to the accounts and secondly, to endeavour to identify the sources of those lodgments. The information obtained from Guinness & Mahon will be referred to in the course of the evidence of Miss Sandra Kells, an Executive of the Bank, and that evidence and the information which will be referred to in it is based on an examination of the company’s records insofar as such records are still available. The Tribunal has been informed that while Mr. Haughey may have had an account or a banking relationship with Guinness & Mahon prior to 1976, the earliest records the Bank has been able to unearth concerning his affairs date from that year. Focusing at this stage on the period from the 1st January, 1979 onwards, it would appear that in the years following that date, Mr. Haughey held four operating accounts in his own name or as I have already mentioned, in his own name jointly with another person. Of these accounts, two were described as resident current accounts and two as resident loan accounts. The last of Mr. Haughey’s operating accounts in his own name was closed on the 9th June, 1987 after the crediting of £285,000 to the account and that, as you will recall, Sir, was the bulk of the proceeds of the Triple Plan cheque referred to in earlier sittings. I propose to set out now very briefly the overall position with regard to each of those accounts in the period from 1979, 1st January onwards. The principal account held by Mr. Haughey was a resident current account and as of January 1st, 1979, the number of this account was 28500/01/50. Due to the introduction of a new computer system, this account number was changed in April of 1983 or at least from April of 1983 to 03356000. This was Mr. Haughey’s principal account with Guinness & Mahon and the total of the sums credited to this account between the 1st January, 1979 and June of 1987 was £1,245,530.91. That total of credits to that account during that period included the Triple Plan cheque that I have mentioned above. Mr. Haughey’s number 2 resident account number 3356019 was opened in May of 1983 and closed in January of 1984. The total of the sums lodged to that account in that seven month period was £211,344.50. 12 The total of the sums lodged to these two current accounts therefore was £1,456,875.41. In endeavouring to examine these accounts, the Tribunal has borne in mind that it would appear that Mr. Haughey did not lodge the proceeds of his salary cheques to any of his bank accounts. Mr. Haughey had in addition two loans accounts of which one was in the joint names of Mr. Haughey and another person. This account was known as resident loan account 04532/01/11. This joint account was opened in November of 1981 and was closed in September of 1984. As of April of 1983, the number of this account was changed to 2318008. The total sum lodged to the account in those years was £229,756.82. Mr. Haughey had another resident loan account number 86256/01/11 which was open from the 2nd September, 1981 to the 1st October, 1981 and the total sum credited to this account was £74,996.83. While on one view it might be appropriate to take the total amount of the lodgments to these two loan accounts and to aggregate them with the total amount of the lodgments to the current accounts mentioned above, this might give an inaccurate view of the total sums credited to Mr. Haughey’s account during the relevant period. Some of the lodgments to Mr. Haughey’s resident loan account, the joint account I have just mentioned, came from partly identifiable sources to which reference will be made later on. Nevertheless, it would appear that some of the lodgments to these accounts are unconnected with any other monies to which reference will be made later on and without further assistance from the account holder, it will not be possible to accurately calculate the total amount of lodgments for Mr. Haughey’s benefit in such a way as to avoid double accounting. At the same time, it is self evident that the size of the sums and the significance of the size of them must be judged in the context of the changes in money values between the early to mid 1980s and today. These sums were very significant and the relative size of the total of the sums lodged to these accounts and the amounts of individual lodgments can be judged when it is borne in mind that, in 1979, a TD was paid an annual salary of £9,590 and An Taoiseach was paid £16,930. By 1987, a TD was paid £19,295 per annum and a Taoiseach was paid £32,790 per annum. It can also be judged against the amount of the Party Leader’s allowance paid to Fianna Fail in 1988 at a time when the party was in opposition and this was £90,660 — sorry, at the time when the party was not in opposition and I will just repeat that, that the size of these sums can be judged against the amount of the Party Leader’s allowance paid to Fianna Fail in 1988 at a time when the party in fact was in Government was £90,660. Evidence will be given to Tribunal by Miss Sandra Kells, an Executive of Guinness & Mahon Bankers, of the extent to which the Bank has been able to provide information to the Tribunal in the form of documentation to enable the Tribunal to identify the sources of the various lodgments to the accounts I have just mentioned between 1979 and 1987. The Bank’s ability to identify these lodgments is, to some extent, hampered by the availability of information in respect of the period prior to 1983. However, the Tribunal proposes in the course of the evidence to examine, so far as it is possible, the information available with a view to identifying either the immediate or ultimate sources of these credits for each of the years from 1979 to 1987. Mr. Haughey has been asked to comment on the various credits to his accounts during that period in an endeavour to identify the sources of those credits but to date he has not made any comment to the Tribunal. In the course of the evidence to be given by Miss Sandra Kells, particular attention will be drawn to a number of lodgments and to the extent to which the Tribunal has been able to identify them. Some of the lodgments will, as her evidence will show, be identified with a significant degree of precision. It has been possible to identify as the immediate source of some of those lodgments the late Mr. Desmond Traynor or accounts controlled by him. Some of these lodgments, as the Tribunal will know from earlier evidence to this Tribunal and from evidence to the McCracken Tribunal, are connected with lodgments made using funds provided by Dunnes Stores’ accounts. The lodgments to which I now want to refer are connected with accounts in the name of late Mr. P.V. Doyle. The Amiens Accounts, as I mentioned earlier, will be referred to although not in detail, to some extent in the course of dealing with transfers from the late Mr. P.V. Doyle which appear to be for the benefit of Mr. Charles Haughey. On the 5th May, 1983, £10,000 was transferred to account 2318008 in the names of Mr. Haughey and another person. And on the overhead projector, Sir, you will see this transaction, the amount was shown on the 3rd column in from the left, £10,000 being debited from account 2041006 and credited to account 2318008. The second transfer was dated the 9th May, 1983 in the amount of £80,000. This amount was debited from the Amiens Securities Limited account I have just mentioned and transferred to Mr. Haughey’s No. 2 current account, account number 3356019. The third sum transferred was £30,000 and this was transferred on the 19th May, 1983 from the Amiens Securities Limited account 2041006 to Mr. Haughey’s No. 1 current account, 3356000. In total, these transfers amounted to £120,000. On the 5th May, there was a lodgement of £40,000. On the 10th May, as you see on the overhead projector, there was a further lodgement of £30,000. And on the 2nd June, there was a further lodgement which, if you can see it on the overhead projector, it’s not very clear, this amounted to £50,000 making in total, as I have said, £120,000. Now, from documents examined by the Tribunal, it appears that the source of each of those three lodgments amounting in all to £120,000 was a loan account in the name of the late Mr. P.V. Doyle. This is account number 6346006 at Guinness & Mahon. And while, Sir, part of the document shown on the overhead projector is obliterated, you will see on the top left-hand corner that the name P.V. Doyle can be discerned. There is a provision for early repayment which says part or full repayment may be made before the 30th April without any penalty, that’s the 30th April 1985. “Enclosed is a copy of this letter and I would be grateful if you would kindly sign it and return it to me” and it’s signed at the bottom, “J.D. Traynor”. Now the material concerning these transactions was brought to the attention of the Doyle Group by the Tribunal and two statements have been made to the Tribunal by Mr. George Carville, an Executive of the Doyle Group and also by a member of the Doyle family. Mr. Carville is an experienced businessman and was Deputy Managing Director and Secretary of the Doyle Hotel Group. His association with the Group and with the late Mr. P.V. Doyle goes back many years. Mr. Carville has informed the Tribunal that while he was not involved in the granting of these loan facilities or in the negotiation of them, he has a vague recollection of the late Mr. P.V. Doyle informing him some considerable time ago that he had guaranteed a loan to Mr. Charles Haughey through Guinness & Mahon. He recalls that Mr. Doyle advised him that he need not worry about this loan as Mr. Haughey had agreed to pay the interest and to refund the capital. In fact this did not happen and by the time of Mr. Doyle’s death, the loan and some of the interest was still outstanding. Mr. Carville has informed the Tribunal that in April of 1988, the — sorry in March of 1988, he attended a meeting at the Berkley Court Hotel, Dublin, which was a Doyle hotel, at the request of the late Mr. Desmond Traynor. The meeting was attended by Mr. Corrigan and Mr. David Doyle. At the meeting, Mr. Traynor explained to those present that the late Mr. Doyle had had an account in Guinness & Mahon at the date of his death on which there was approximately £150,000 due. Mr. Traynor explained that this was an account that the late Mr. Doyle had opened to facilitate Mr. Haughey who was apparently financially embarrassed at the time. Mr. Traynor went on to explain that the arrangement provided for the interest and capital to be repaid by Mr. Haughey and that while some payments had been made, these payments had stopped and that the current situation was that there was no hope of the loan being repaid. It would appear that the Doyle executives judged that the loan would not be repaid and that there was no hope of recovery from any other source. They recommended to Mrs. Margaret Doyle, the widow of the late Mr. Doyle, that the account be closed and this was done with a payment of £150,230 on the 23rd March 1988. The original cheque used to pay off this account is not available but a photocopy has been obtained by the Doyle Group from the Bank of Ireland and the cheque is on the overhead projector and although it is slightly indistinct from the figures, you can see the writing, it’s for £150.230. This cheque is dated the 23rd March, 1988. It is drawn on the account of P.V. Doyle Holdings Limited at the Bank of Ireland Pembroke branch and it is made payable to Guinness & Mahon. It was signed by Mrs. Doyle and it was cashed in due course and the late Mr. Doyle’s facility at Guinness & Mahon was cleared. On the 30th April, 1985, there was a lodgment of £52,495.86. On the 9th June, 1989 there was a lodgement of £9,966.74. On the 31st July of 1987, there was a lodgement of £45,000. On the 24th August 1987, there was a lodgement of £5,000. Now the source of the first of these lodgments appears to have been a transfer from an Amiens Securities Limited account 08116008. This account will be referred to later on in the course of this opening statement, Sir, as the account from which the initial outside contributors to Celtic Helicopters paid £75,000 toward the setting up of that company and that was in 1985. The source of the second interest payment was also a transfer from an Amiens Securities Limited account number 10407014. It appears that there was a lodgement to this Amiens Securities Limited account on the 14th May of 1987 of an exactly similar amount to the interest payment, that is to say of the sum of £9,966.74. That particular credit represented the lodgement of a cheque dated the 11th May 1987 drawn once again on the Pembroke branch of the Bank of Ireland, this time drawn on the account of P.V. Doyle No. 1 account. As you see from the overhead projector, Sir, it is made payable not to Guinness & Mahon as was the case with the last cheque I mentioned but rather to Des Traynor. It’s dated the 11th May and it appears to be signed by Mr. P.V. Doyle. The source of the third interest payment appears to have been a cash lodgement. Likewise, the source of the fourth interest payment of £5,000 also appears to have been a cash lodgement. The Tribunal has not as yet been able to establish the precise source of the credit of the 30th April, 1985 in the sum of £52,495.86 except to the extent I have already mentioned, that it was connected with an account from which the £75,000 was transferred to the account of Celtic Helicopters in 1985. Whether the existing connections between the Doyle Group and loans for the benefit of Mr. Haughey in the absence of any other information warrant the conclusion that the Doyle Group or Mr. P.V. Doyle was the source of all of the interest payments to the loan account. Or whether Mr. Haughey or any other person made, or was requested to make any repayment of either principal or interest on this loan. Now, at the time that this loan was discharged, it stood at £126,312.40 outstanding. This was because of the interim interest payments I have just mentioned already made to the account. It would appear therefore that Mr. Haughey received the benefit of the total amount of the balance outstanding at the clearing of the account together with the aggregate of the four interest payments up to that date. The grand total comes to £238,775. Once again Mr. Haughey has been asked to comment on this loan and subject to any evidence he may give or any assistance he may provide to the Tribunal on the matter, it will be a question for the Tribunal as to whether the conclusions suggested above are warranted in the light of the evidence to hand. On the 23rd December, 1985, £10,000 was drawn down. Another £10,000 was also separately drawn down on that date. On the 29th January of 1986, a further £10,000 was drawn down. You will see that on the overhead projector. It’s the first entry from the top. On the 14th January of 1986, £10,000. The 14th February of 1986, sorry, of £10,000 was again drawn down and this is being pointed out on the overhead projector. And on the 17th April, a further £10,000 was drawn down. So if we could just leave that document on the overhead projector for a moment. That bank statement shows three of the £10,000 sums drawn down on in January, February, and April of 1986. The fifth sum of £10,000 was not drawn — was drawn — sorry, if I could over that, I may have confused you or confused the stenographer. In all, there were five payments of £10,000, two were made on the 23rd December, which I think I will go back over. The first of those is dated the 23rd December and it’s the first payment shown on the overhead projector. The second payment of the 23rd December was described in the documents as being a payment to Frank Glennon, a firm of insurance brokers. Passing on to the second document once again, and just to recap, the other £30,000 was drawn down in three tranches in January, February and April of 1986. While as I have indicated one of those £10,000 payments was made to Frank Glennon, a firm of insurance brokers, it would appear that the other four debits of £10,000 were lodged to an Amiens Securities Limited account 08880018. The Amiens Securities Limited account to which this £40,000 was transferred in the manner I have just mentioned was an account from which payments were made to Haughey Boland & Company and you will recall, Sir, from earlier evidence, that this was an account from which Haughey Boland & Company made payments on behalf of Mr. Haughey as part of the bill paying service provided by that company to Mr. Haughey. Further evidence will be given in the course of these sittings concerning the operation of this service. From an examination of the documents made available to the Tribunal concerning this loan account, it would appear that there were two repayments to the account. These were in the amounts of £2,000 and £13,000 respectively. Each of these payments was made on the 26th January of 1987 and they are being pointed out on the overhead projector. From internal bank documentation provided by Guinness & Mahon, it appears that the source of the lodgement of £13,000 was an account transfer from Amiens Securities Limited Account No. 10407014 and this is the Amiens account through which the proceeds of the Triple Plan cheque were channelled prior to being credited to Mr. Haughey’s No. 1 Current Account. It is also the account to which the Dunnes bearer cheques mentioned in earlier evidence were lodged in February of 1987. The other repayment, the repayment of £2,000 was a cash lodgement. These accounts and further bank backing documentation concerning the transactions resulting in these two payments to the account will be scrutinised with a view to examining the source of the repayments amounting in all to £15,000. Now the debit balance on this No. 2 Loan Account at the time of repayment was £48,182.27. And this No. 2 Loan Account was cleared on the same date as Mr. Doyle’s earlier loan account which I have called the No. 1 Loan Account. The bank’s internal documentation shows that the clearing of both loans was a single transaction. The total sum paid to the bank in respect of the No. 2 Loan Account was £62,363.92, being £50,000 or the principal sum due and £12,363.92 interest. As the sum paid on what I call the No. 1 Loan Account was in total £238,775, the amount of the two loan accounts was £301,138.92 and this would appear to be the extent to which Mr. Haughey benefited. The total sum used to clear the two loans in Mr. Doyle’s name was in February of 1988, was £174,494.67. That was the balance due on the loans at the date they were cleared. You will recall, Sir, some interest was paid on those loans. Payment made by the estate of the late Mr. Doyle to clear the account was £152,230 and this therefore left a balance of £24,264.67 which was paid out of the Amiens Securities Limited Account No. 10407014. As yet the Tribunal has not been able to establish with precision the source of funds used to clear this further balance of £24,000 odd. I now want to deal with a number of discrete matters connected with the Amiens Accounts. In its examination of the Amiens Securities Limited accounts and in particular account 08116008, it has come to the attention of the Tribunal that there was some noticeable credits to that account in 1985 and in particular, a lodgement to the account in the sum of £50,000 on the 19th February, 1985. To repeat, this is the account from which the initial £75,000 payment by outside contributors to Celtic Helicopters was funded. The Bank’s, that is Guinness & Mahon’s internal documentation, indicated that the source of this credit of £50,000 was a cheque for that amount. The Bank has been able to retrieve a copy of this cheque from its microfiche records. The cheque is dated the 18th February, 1985 and was drawn on an account at the Bank of Ireland and although the overhead projector does not make this clear, that account was at the O’Connell Bridge branch of the Bank of Ireland. The account on which the cheque was drawn was the account of a Mr. John O’Connell. The cheque was made payable to cash. This account is an account in the name of Dr. John O’Connell, who has already given evidence to the Tribunal. Dr. O’Connell has informed the Tribunal that this cheque payment of £50,000 is connected with an arrangement he made with a Mr. Fustok, a Saudi Arabian diplomat. Dr. O’Connell has informed the Tribunal that in or around 1981, he was introduced to Mr. Fustok at Goffs Bloodstock Sales. He has informed the Tribunal that Mr. Fustok is a Saudi Arabian diplomat who is related to the Crown Prince of Saudi Arabia; that Mr. Fustok is involved in the bloodstock business and that he occasionally came to Ireland to purchase bloodstock and that on one such visit in 1981, Dr. O’Connell introduced Mr. Fustok to Mr. Charles Haughey. Dr. O’Connell has informed the Tribunal that he subsequently became very friendly with Mr. Fustok and that he used to see him regularly when he came to Ireland and that sometimes he used to see him in London; that in or about February, 1985, when he met Mr. Fustok on a social occasion, Mr. Fustok asked him to pass on a payment of £50,000 to Mr. Charles Haughey. Dr. O’Connell has informed the Tribunal that Mr. Fustok stated that this was money that was owed by him to Mr. Haughey. He has also informed the Tribunal he did not then know what this payment was for. It would appear that a cheque was given to Dr. O’Connell by Mr. Fustok, that this cheque was lodged to Dr. O’Connell’s account in the Bank of Ireland on the 22 February, 1985 but that one day previously — that several days previously, Dr. O’Connell himself had written a cheque for £50,000 to carry through this arrangement. It would appear that Dr. O’Connell had been in touch with Mr. Haughey in connection with this cheque and he has informed the Tribunal that Mr. Haughey asked him to make it payable to cash and this is, as the overhead projector shows, what Dr. O’Connell did and he then delivered the cheque to Mr. Haughey in Dublin. The Tribunal has sought information from Mr. Fustok concerning this arrangement and he has informed the Tribunal that this sum was paid to Mr. Haughey for a racehorse which he purchased from the Haughey family in 1985. Mr. Fustok has informed the Tribunal that as he purchases and sells so many racehorses and as his records do not extend as far back as 1985, he is not able to provide any details of the horse in question. The Tribunal has been in correspondence with Mr. Fustok in the United States and he has been requested to provide further assistance to the Tribunal and to attend to give evidence. The Tribunal wrote to Mr. Fustok on the 28th January, 1999 requesting his attendance — sorry, the Tribunal wrote to Mr. Fustok on the 28th June, 1999 requesting his attendance but has not as yet received any response. the fact that the route chosen was a very indirect one; that the money was not paid directly by Mr. Fustok to Mr. Haughey; that a cheque was not as you might have expected made out to Mr. Haughey and handed by Mr. Fustok to Dr. O’Connell for onwards transmission to Mr. Haughey; the fact that a cheque appears to have been given to Dr. O’Connell and a further cheque made out by Dr. O’Connell to cash and handed to Mr. Haughey by Dr. O’Connell in circumstances in which as he states, he then knew nothing of the purpose for which the payment was being made. Mr. Haughey once again has been asked to comment on the matter and to provide details to the Tribunal concerning this transaction but he has not done so so far. Thank you, Sir.